Hot this week: Palmyra. Just Palmyra. Conference review. Trade-heavy and academic-light, but useful talks on the state of illicit antiquities play globally all staged in a late 1950s modernist pseudo utopia. The Museum was heavily damaged in early 2014 in a major car bombing. Concerning the possible return of the looted bronze from Cambridge, “This is a breakthrough and sign of good things to come,” said National Commission for Museums and Monuments Director-General Yussuf Abdallah Usman. A mine at Canteen Kopje outside Barkly West in the Northern Cape has been stopped by interdict for causing unknown damage to a large area of an archaeological site. A new film about the looting and then the saving of the spectacular Lord of Sipán tombs. The Supreme Court has declined to hear a case that asserts that Van Gogh’s The Night Café was illegally seized during the Bolshevik revolution. Only the shoes of the piece were left behind making one wonder why this theft occurred. It’s been 26 years, will we ever see the stolen Isabella Stewart Gardner Museum paintings again? Some art crime stories from former FBI art crime agent Robert Wittman. A bit hard to follow, but it seems the owner of a real Motherwell is suing the house for putting up and taking down a fake of their painting. “The Manhattan District Attorney’s office has begun an inquiry into possible criminal misconduct by Larry Gagosian” over a disputed Picasso purchase. Dealing with sacred art destruction in a historic Iowa church. Responding to a recent wave of cemetery vandalism. David Toren, one of the few people who has had a painting returned from the Gurlitt hoard. “The Ute Mountain, Uintah and Ouray Utes, and Navajo, Hopi, and Zuni tribes have formed the Bears Ears Intertribal Coalition” to help work towards the preservation of Bear Ears from looting and development. Files have been stolen from Uruguay’s Forensic Archaeology Unit concerning the search for people disappeared during the dictatorship. The pieces were in the church of Ayios Iacovos in Trikomo; they were looted following the Turkish invasion and identified in possession of a Switzerland-based art dealer. The option to digitally graffiti Giotto’s Campanile, not really vandalise it. Strips of lead were taken off the roof of the 13th century Holy Trinity church south of Bury St Edmunds. A matching offer was not made in time to prevent the statue, controversially auctioned by the Northampton Museum, to stay in the UK. St Bridget’s Kirk, Dalgety was tagged with purple paint. Only a handful of the looted Indian antiquities in Australian museums have been returned. There is indication that a photograph of the piece being looted or shortly after theft has been obtained. The shield was taken by Captain Cook at Botany Bay in 1770. Tiffany Jenkins on not returning cultural property to it’s place of origin. The beautiful pieces are now on long term loan from Te Papa in New Zealand. The Smithsonian’s Jane Milosch, director of the Provenance Research Initiative, talks Cambodian statue returns. The Denver Art Museum has now given the the Rama back. It is in Cambodia with the rest of the Prasat Chen returns. Two Brahma heads taken from Koh Ker were returned from an unnamed Paris collector. The State Directorate of Arts and Culture has been ruled accountable for the loss of several priceless artifacts from Captain Williamson Sangma State Museum. The police were able to trace the ancient granite idols stolen in 2013 to Chennai and recovered them. They were taken from the Balasubramanian temple, Nammalwarpet. The Nandi had been stolen before and recovered. The idols were taken from a Murugan temple near Ayanavaram, the first time this has happened in the area. The bell, found in a Nellithope canal, belonged to Sri Muthu Vinayagar Sri Muthukumarasamy temple and is presumed stolen. Theft of a Lord Krishna idol from Bajkhe Bihari temple; the theft was discovered when the priest opened the temple for the day. The 700-year-old pieces were taken on 15 March and were recovered following a police vehicle check at Pandurangapuram village. The community is demanding a police investigation into the theft of the piece. About 200 coins were found ti be missing from the small museum at Nagpur University. Now the report about their theft is missing as well. An anonymous panel member claims that of 900 registered artefacts that are registered to be at Nagpur University, only about 250 are actually there. This seems to be the same legislation from last year, they seem to still be working hard to push it through. The family of artist Chun Kyung-ja has filed a suit against the National Museum of Modern and Contemporary Art saying they have fakes. A failed media attempt to meet with looters, but some discussion about poor people digging. He found the coin, took it back to Germany, and is now doing the right thing (returning it). Outlets are reporting that Palmyra is ‘better than expected’ but it is unclear what they mean by that. Mostly images from directly after the Syrian army and Russian air retake of Palmyra. 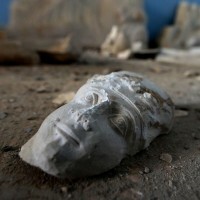 A talk with archeologist Annie Sartre-Fauriat who questions the political use of Palmyra and the ethics of rebuilding. I would proceed with caution before believing anything like this without independent verification. The 1971 sites of torture and mass graves are too recent to be preserved under the law. Warning, very upsetting photos. Whoever took the skull is asked to kindly return it. A Banksy on his bum? A fun radio play about art market weirdness. The Soulbury Boot will remain where it’s always been, kinda in the middle of the street. Hans Honschar draws inspiration from Keith Haring, but Haring didn’t draw directly on city property. Art and vandalism.